FireFly light up technology teaches kids to brush their teeth for a minute. 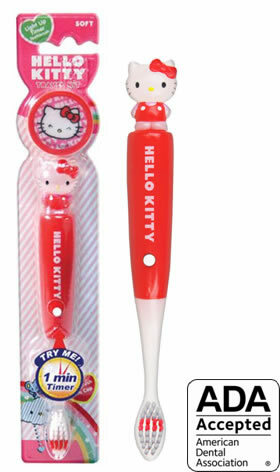 Hello Kitty makes brushing fun. Comfortable handle grip, soft DuPont bristles and toothbrush cap. FireFly light-up flashes for 60-seconds at a time (the length of time recommended for thoroughly brushing one arch) as a child brushes. The light stops blinking after 60 seconds to indicate when it’s time to move on to the other row of teeth and start the light again. The light stops functioning after approximately 3-months of use to let parents know when it is time to purchase a new toothbrush.